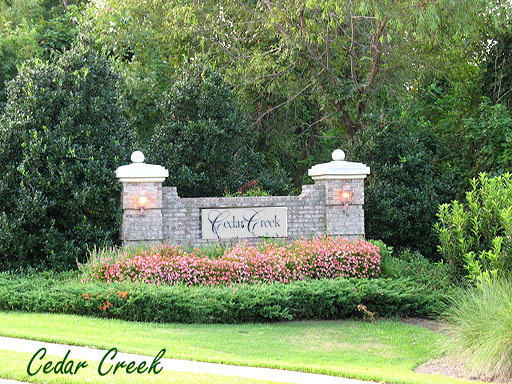 Overlooking Barefoot Resort’s beautiful Love Golf Course, the Cedar Creek neighborhood features large spacious homes from 2,000 to 3,000 square feet in size with contemporary, ranch and traditional styling. One of resort’s more upscale neighborhoods, homes here feature 3- and 4-bedroom floor plans and range in price from $250,000-$400,000 and up. 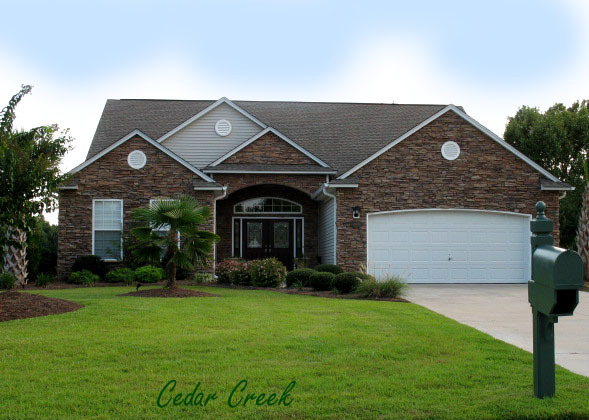 Many homes in the community feature great views of the Love course’s 4th, 6th and 7th holes along with views of The Ruins, the unique stone recreation of the ruins of an old plantation house. The Love course itself is a traditional layout with wide fairways and ample landing areas. At 7,047-yards, it’s consistently ranked by major golf magazines as one of the best courses in South Carolina and America. Along with the Fazio and Norman courses, it shares a beautiful state-of-the-art 27-acre practice area. 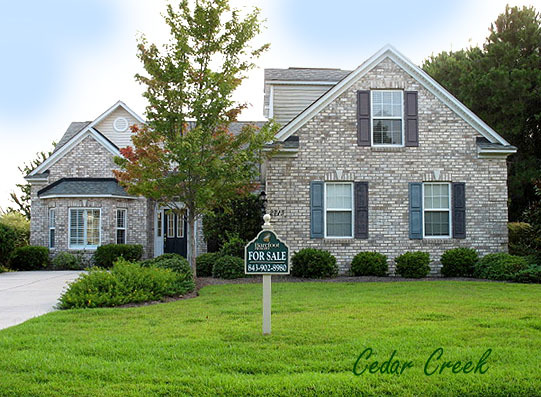 Cedar Creek homes feature an array of fine appointments. Depending on the home’s style, features include granite countertops, kitchen work islands, hardwood and tile flooring, formal dining rooms, eat-in kitchens, marble-faced fireplaces, sunrooms and more. Oversized garages are a featured in some homes as are screened verandas and private patios, perfect for relaxing and entertaining. The neighborhood is close to the Residents Clubhouse, which features an enormous pool, Jacuzzi, full-featured clubhouse, game room, Jacuzzi, grilling area, a first-class fitness facility, covered patio, media center, library and more. Other privileges that come with ownership are Barefoot’s fabulous amenities that include golf privileges on the Love course and Barefoot’s three other famed courses designed by Tom Fazio, Pete Dye and Greg Norman. There’s also the full-service Barefoot Marina and free shuttle service to the resort’s exclusive beachfront cabana. 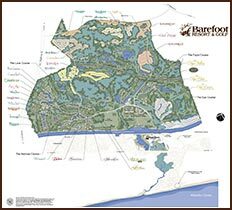 Residents can also take advantage of the resort’s numerous lakes and parks and miles of walking and biking trails meandering through Barefoot’s spectacular subtropical 2,300 acres. Adjoining the resort, there’s also the unique shopping and entertainment complex of Barefoot Landing next to the Intracoastal Waterway with boardwalk shopping with a 27-acre lake as its centerpiece. Home to scores of fantastic shops of every kind, Barefoot Landing is also home to 15 great restaurants and entertainment venues with well-known names that include Alligator Adventure, Alabama Theatre and House of Blues.